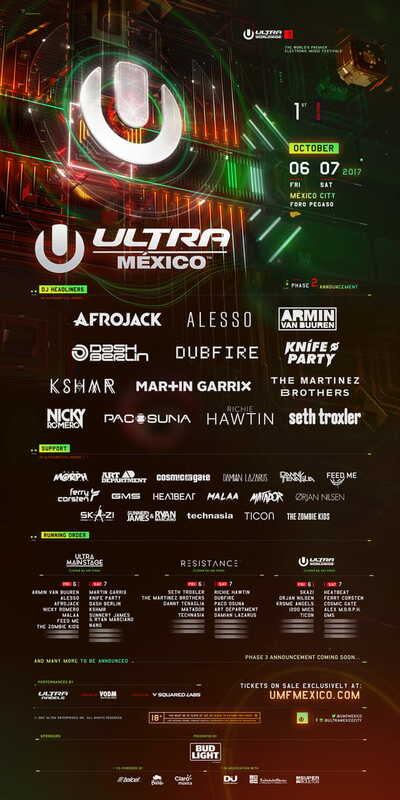 ULTRA México's Phase Two Lineup has been announced and it features Knife Party, Nicky Romero, and KSHMR who join the aforementioned headliners Afrojack, Alesso, Armin Van Buuren, Dash Berlin, Dubfire, Martin Garrix, The Martinez Brothers, Richie Hawtin, and Seth Troxler. Held at the massive Foro Pegaso venue, Ultra México is conveniently located just 20 minutes from Toluca International Airport. Tickets can be purchased for the 2-day experience for $177 USD.